The 2015-racing season is quickly approaching the halfway stage at Macon Speedway, which means the huge event portion of the schedule is upon us. The next four events on the schedule are considered “can’t miss” with everything from fireworks, to POWRi Midgets and Micros, to the Hell Tour Series Late Models, and a Garth Brooks Tribute Band. It all begins this Saturday night with the Firecracker 40’s presented by 95Q and Dynagraphics/Wood Printing. 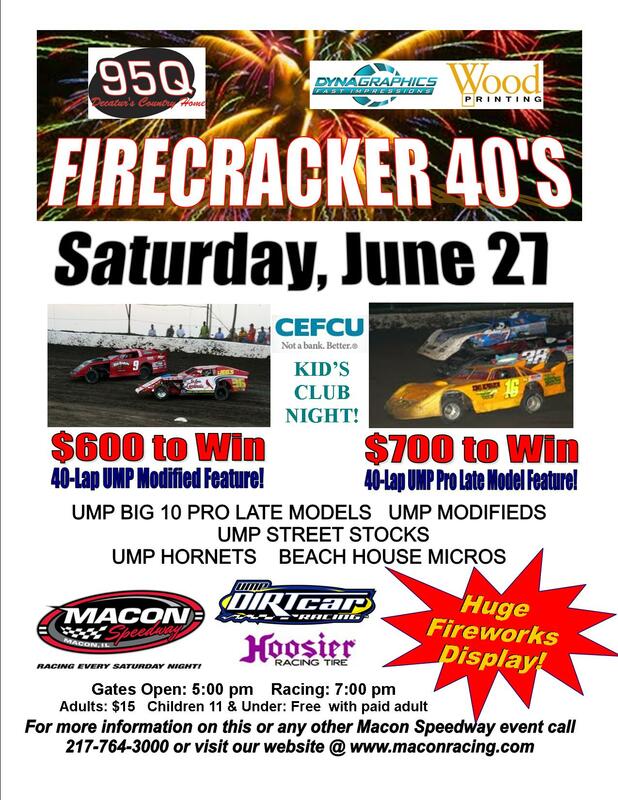 In addition to the Big Ten Pro Late Models in a 40-lap event and the Billingsley Towing Modifieds running a 40-lapper, area race fans will have their first chance at a holiday inspired fireworks display. The pyrotechnic display should take place just after dark. Street Stocks, Hornets, and Beach House Micros will also be racing. The busiest part of Macon Speedway’s schedule then comes up the following week, starting with a holiday weekend double header. On Friday, July 3 and Saturday, July 4, the first ever POWRi Freedom Fest will bring race teams and fans from all over. The Midgets and Micros will be running both days in addition to a special non-wing Micro show. UMP Street Stocks will add to the show on Friday night, while the Billingsley Towing Modifieds will run on Saturday. Friday’s show will include fireworks, while Saturday’s show will start off with a Garth Brooks Tribute Band from 4:00-7:00. The weekend is huge and will be filled with great racing and entertainment. Just a few days later, on Thursday, July 9, the 35th running of the Herald & Review 100 will take the green. Some of the best UMP Super Late Model competitors will be there, running with the Summer Nationals Hell Tour. The Billingsley Towing Modifieds and the B-Mods will make the evening jam packed with great racing entertainment. Entering this Saturday night’s action, Guy Taylor, of Springfield, IL, leads the Big Ten Pro Late Model standings by just two points over New Berlin, IL driver Nick Bauman. The battle is actually tight for the top three, as Myles Moos is just two more behind second. This weekend will be busy for the Pro Late Models, as they also have a Big Ten event on Friday night at Jacksonville Speedway. When it comes to tight point battles, the Billingsley Towing Modifieds are as close as it gets. Germantown, IL driver Rodney Standerfer has won two straight features to tie Jeff Graham, of Stonington, IL, for the point lead. Tommy Sheppard, Jr. (PLM), Terry Reed (SS), and Adam Webb (H) are the other Macon Speedway front-runners entering the June 27 event. On Saturday, June 27, pit gates will open at 4:00, grandstands at 5:00, hotlaps will begin when pill draw ends at 6:00 sharp, and racing action will take the green at 7:00. Grandstand admission is $15 for adults and free for children 11 and under.